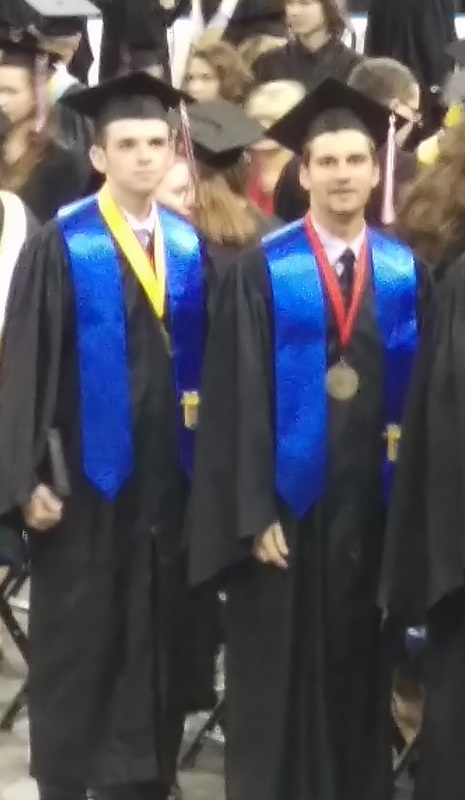 Tyler (right) and one of his good friends, Jeff, at the Graduation ceremony. At the end of May, Tyler graduated from high school and we celebrated with a party a few weekends ago. Thankfully, after a week of continuous rain, we dodged a bullet and had a dry day for it. We needed to put down a couple of bales of straw purchased at the last minute so the backyard volleyball court didn’t turn into mud volleyball. Other than being the typical Midwest hot and humid, it was a great day for an outside party. I’m not sure why it came as a surprise to me when I was reminded that our firstborn is the same age that we were when we met. 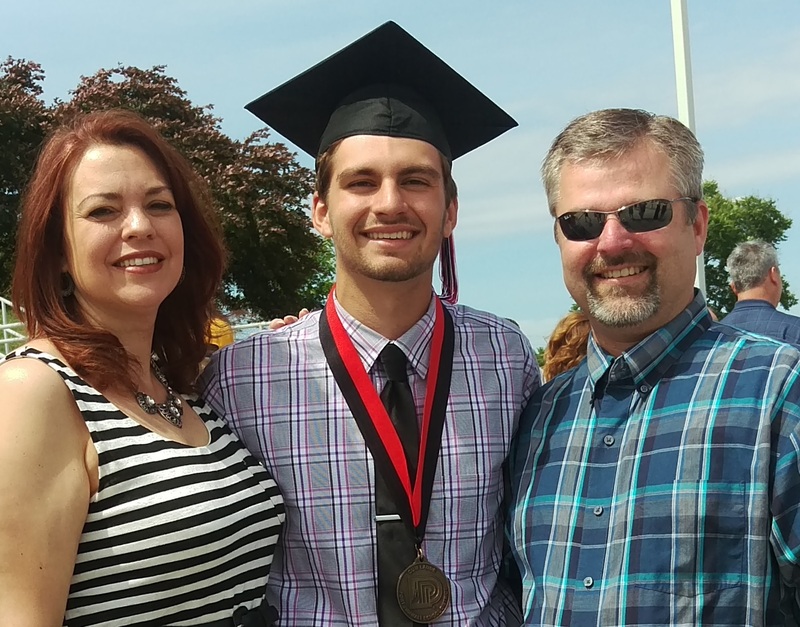 With everything going on these days, I hadn’t had time to process that our little boy was on the brink of adulthood. Yes, the kid who can’t keep track of where his car keys and shoes are most of the time is moving four hours away where he will be in charge of himself completely. While I know that we will miss him doing Tyler-esque things like walking around the house, strumming his guitar and bugging his sisters with impromptu songs about whatever it is they’re doing, I can’t help but be excited for him as he starts this new chapter in life. Where he has trepidation about making all the right decisions, I see nothing but a blank slate of potential. I’m not so old that I don’t remember the uncertainty of being 18, but I wish he knew that when it’s all said and done, he’ll look back at this time and wish he’d savored it more instead of wishing it away to be an adult in the working world. When you’re 18, your family, high school and the people you’ve been in school with over the past few years are truly your realm of experience. For many, college is the first point in life where you step into your own. It’s a time for learning more about yourself and how you fit into this big, wide world. You meet people with personalities and ideas that you may have never been exposed to before. It can be a little intimidating, but ultimately shapes you into the person you were meant to be. I am convinced that the timing for a child’s (ahem, I mean young adult’s) departure for college correlates perfectly with his parents’ patience (aka tolerance) level for having another almost-adult present in the home. Little things Tyler does, like leaving shoes all over the kitchen—nothing new—seem to get under my skin a little more than they used to. I think it goes both ways, because I feel like Tyler gets annoyed with us about things, too. In these waning days before he heads off to school across the state, I look at my son with a little more tenderness. I overlook the empty Pop Tart wrappers he leaves around the house and grumble a little less when he forgets to put his dishes in the dishwasher. (I said a LITTLE!) I find myself giving in a little more often when he asks if we can do breakfast for dinner. At the heart of it all, I’m proud of all he’s accomplished, and I can’t wait to see what the future holds for him. The happy graduate with me and his dad, that cute blonde boy from Freshman Orientation all those years ago. You and Darrell have raised a fine young man! Here to the next part of his and your journeys. I love that picture of you, Tyler and “The cute guy from Orientation.” “Eyes wide open!” That’s how going to college felt. So much to see, do, and confirm. I say, “LET THE GROWING BEGIN!” (But, get all the smuggle time in that you can muster and steal before he leaves.) Great Post! Thanks, Kim! Was trying to find where I had a copy of you holding him at your high school graduation. The one Matt took was great of the two of you. Hopefully a rare roommate type, who loves a “tidy” dorm room or apartment! Or, by example, demonstrates daily/weekly studying as a real necessity rather than quickly perusing material or “all nighters” before an exam or paper’s due! Amazing, how fast we’ll adapt & adopt those “cool” revolutionary habits of a peer, our parents have tried to instill a whole “lifetime” before? Yes, he was a total blonde when he was a kid. He tries to pass off his gray as blonde now…it worked for awhile!